A few weeks ago I had the opportunity to shoot for the Springs Condominiums in downtown Austin. This Austin highrise is renovating the 42nd floor Penthouse so I had balconies to photograph the Austin skyline that faced both north, east, south, and west. 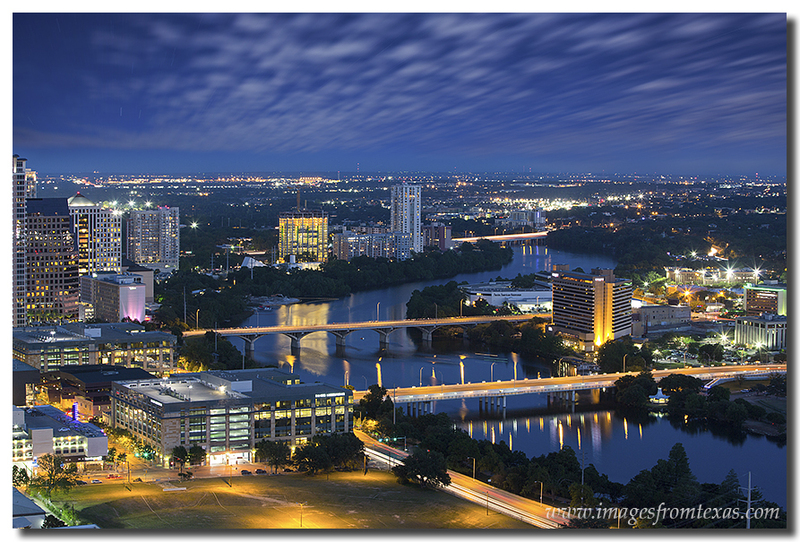 The location offered a great panorama of Austin, from Ladybird Lake almost directly below me to I-35 in the distance. I was able to capture Texas State Capitol images, as well as photos of the UT Tower. I also obtained some unique perspectives of the Frost Bank Tower with a Southwest Airlines jet landing in the background. All in all, I hope they can use the images of Austin, and I loved the view from this amazing location. Thanks, Springs Condominiums! Here is an Austin Skyline Image looking down at Ladybird Lake. The Austin Hyatt is on the south side of the river and the Milago Condominiums in the largest building in the distance, with I-35 behind it. This Austin image was two images blended together. The sky was a longer exposure to show the clouds moving across the sky. This Austin Skyline picture features Ladybird Lake below and some of the Austin high rises in the distance.